Oxford Dictionaries' 2015 word of the year is difficult to pronounce. Because it has no letters. It is a cartoon yellow face, shedding two giant tears. They are not tears of sadness for the English language. It is a happy crying face, most commonly used as an LOL alternative. Every year, Oxford Dictionaries' lexicographers chose a word that captures the year's biggest trends or changes in the English language. The organization knew it wanted to pick an emoji for 2015. The tiny illustrations that pepper social media and text conversations have seen a surge in popularity in recent years. "You can see how traditional alphabet scripts have been struggling to meet the rapid-fire, visually focused demands of 21st century communication," said Oxford Dictionaries' president Casper Grathwohl in a statement. "It's not surprising that a pictographic script like emoji has stepped in to fill those gaps." The official name for the chosen emoji is "face with tears of joy," according to the Unicode Consortium, the organization in charge of emoji standards. It was first introduced in 2010 and variations can be found on Android and iOS devices, on the web, and across social media. There are more than 1,000 emoji characters, but Oxford could only chose one. A taco or unicorn emoji would have represented the most buzzed-about newcomers. The red heart is one of the oldest emojis. Oxford Dictionaries teamed up with SwiftKey, a maker of emoji keyboards, to identify the most commonly used emoji. 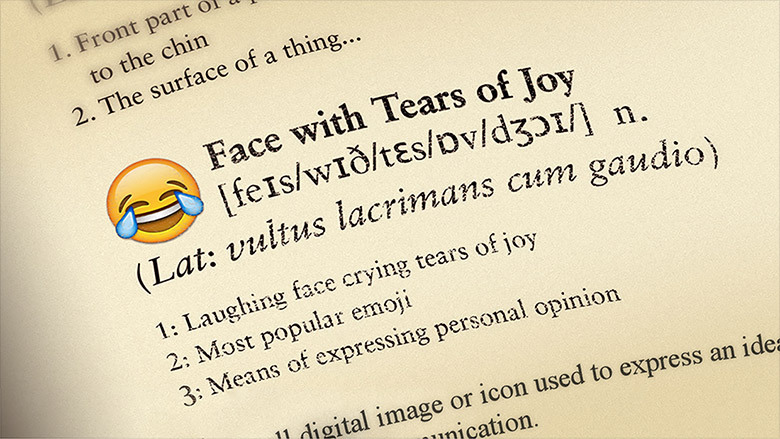 It found the tears of joy face was the most frequently used emoji in 2015, making up 17% of all emojis in the U.S. and 20% in the UK. The emoji is the latest in a string of light-hearted picks from Oxford Dictionaries. Last year it went with "vape," in 2013 it was "selfie," and in 2012 it was "GIF."